Morning Savory Breakfast while growing up were a few repeat options. Poha, Upma, Savory Chickpea Flour pancakes, steamed savory cakes etc. 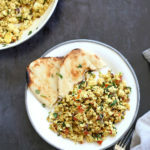 Egg bhurji (Indian scrambled eggs), and paneer bhurji(scrambled paneer) were one of the options for days one of us kids had some active events. 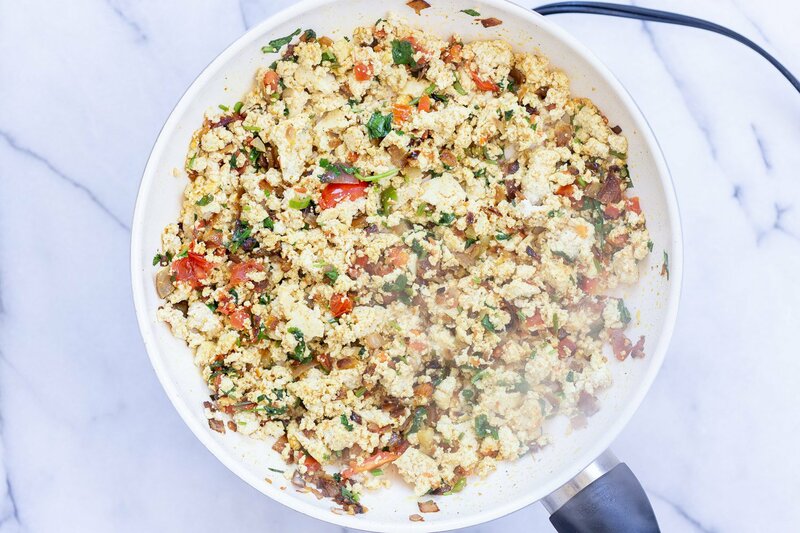 Bhurji means scramble mix. The key feature of my Mom’s bhurji was that there would be more of the onion, tomato and cilantro than the paneer. It must have been because one of us was picky about it. But the balance of those flavors works out so perfectly! 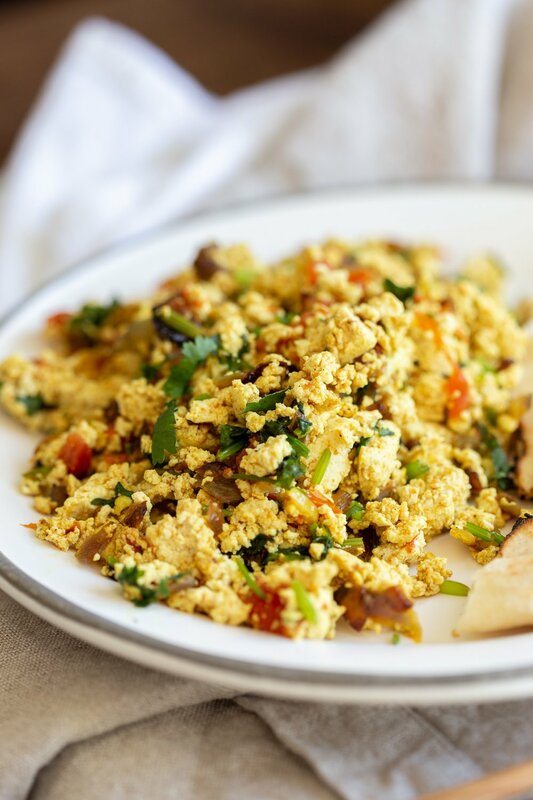 This version with tofu is a simple scramble with a few ingredients. But when done, it becomes a vibrant, delicious, savory, satisfying meal to start the day. 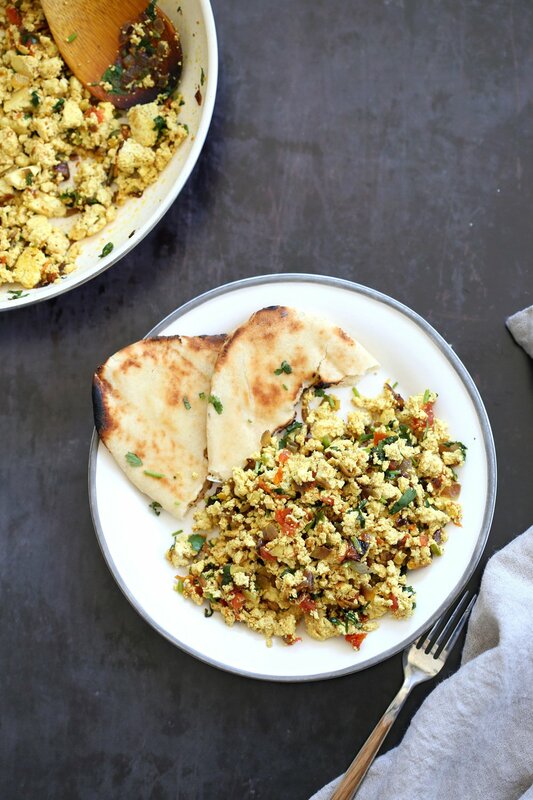 The bhurji is best served hot with toasted breads or in a breakfast bowl. Make this with chickpea flour tofu for soyfree. The recipe is flexible to taste, add veggies of choice, change up the spices and make this your own. Onion is cooked to golden. 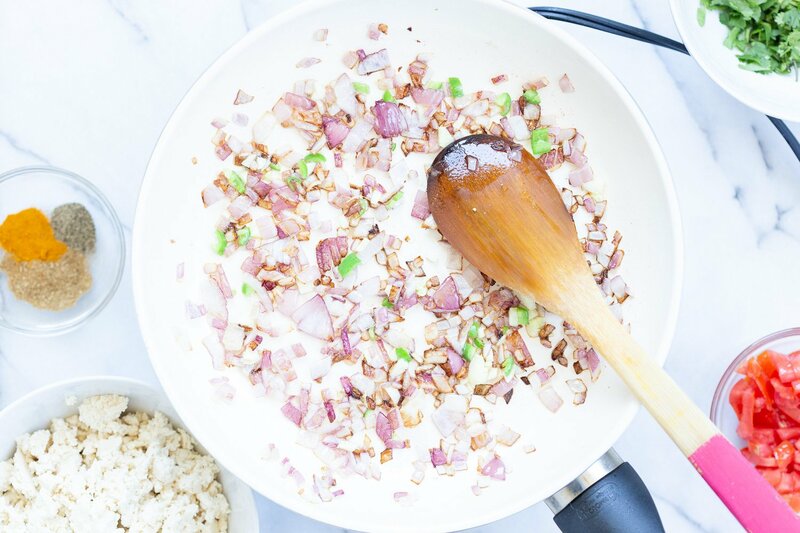 It adds volume to the dish as well as a balance of sweet caramelized flavor. You can use zucchini or a neutral squash as a substitute. Or use other veggies to bulk up such as peppers. Garlic and green chilies are added and cooked to have a bit of a bite for a fresher flavor. You can omit the garlic if you wish and use mild chilies or green bell pepper as a substitute for the chili. 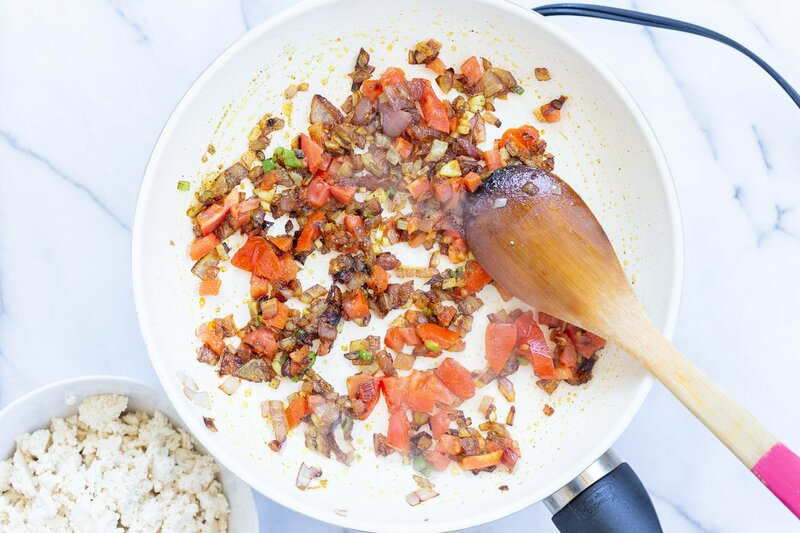 Turmeric, cumin or coriander, a good amount of black pepper are added and sauteed into the veggies. 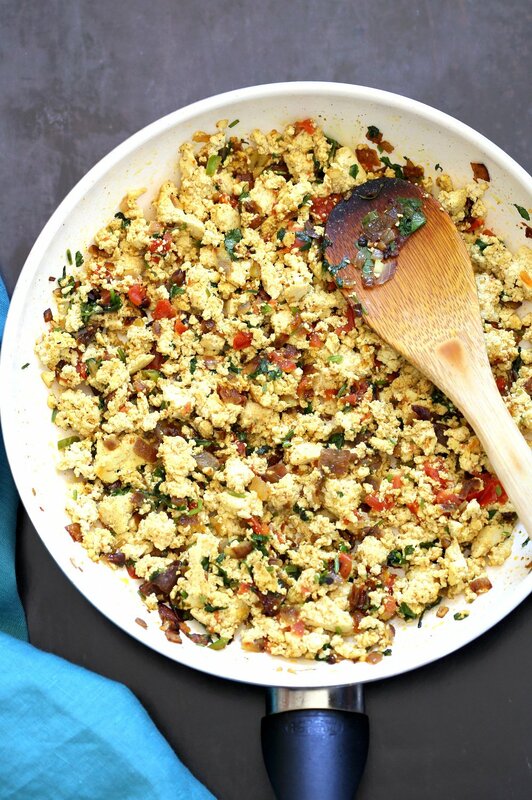 This dish is is mildly spiced with simple spices for a quick satisfying breakfast. 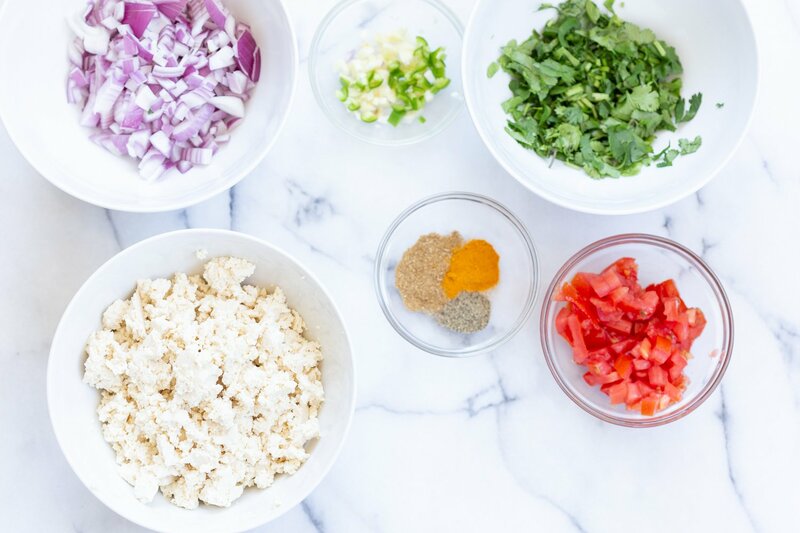 The earthy turmeric and cumin and fresh pepper work really well with the onion, tomato, cilantro base. Change these up to preference. Tomatoes are added and cooked just a bit for moisture and tang. You can add other veggies too. Cilantro is the key ingredient here. A good load of cilantro adds an amazing flavor profile. Crumbled up tofu and salt are then folded in and cooked. Tofu can be subbed with chickpea flour tofu or mashed chickpeas. Add a bit of water with the chickpeas to moisten. Kala namak, the indian sulphur salt is sprinkled for the eggy flavor and lightly mixed in the end so that the eggy flavor does not cook out. If you dont have it, use regular salt. The egg flavor is not the highlight of this bhurji. It is delicious with or without. Add more for more eggy flavor. Assemble the ingredients. Chop and keep ready. Start by cooking the onion to golden. Then add the garlic and chili and cook for a minute. Add the tomatoes and cook for half a minute. then add the cilantro, crumbled tofu and salt and mix in. Cover and cook for a few minutes to heat through. Add in the kala namak and mix in. Take off heat and let sit for a minute before serving over toasts, pita bread or part of a breakfast bowl with roasted potatoes, crunchy greens. Toasted and buttered sandwich bread of choice. Make wraps with the bhurji with roasted veggies or potatoes and a sauce/dressing. Heat oil in a skillet over medium heat. Add onion and cook for 3 mins or until starting to get golden. Add garlic and chili and a pinch of salt and cook for another 2 mins until golden. Add cilantro, crumbled tofu and 1/4 tsp salt and mix well. Cover and cook for 2 mins (longer for dryer). Taste and adjust. Sprinkle in kala namak, and mix in for a few seconds and take off heat. Let sit for a minute before serving over toasts, pita bread or part of a breakfast bowl with roasted potatoes, crunchy greens. Soyfree: Tofu can be subbed with chickpea flour tofu or mashed chickpeas. Add a bit of water with the chickpeas to moisten. 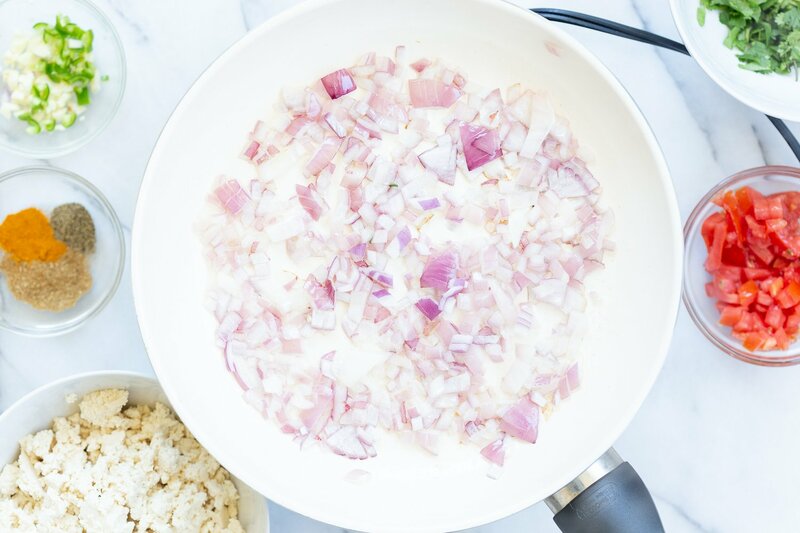 Oilfree: Use water or broth to saute. Also see above in the post for substitution options. Loved the recipe. A couple of things I did were to use at least 4 finely chopped onions and I also grated the tofu, instead of crumbling. Everyone loved it! Thank u for the recipe. Your recipes are simple and keeps Richa. Also the alternative options you give, great idea. Thanks. When do you add the cilantro? 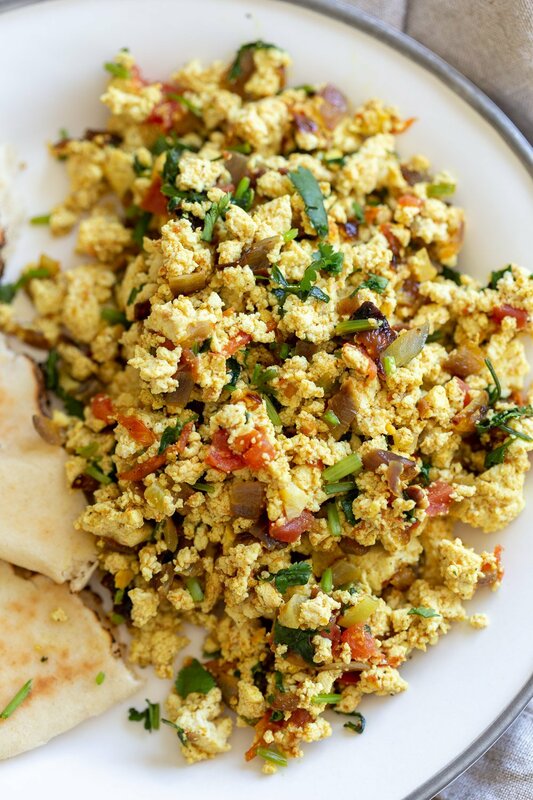 Love this flavor take on tofu scramble, which I have at least once a week. I like learning your process for when to layer the spices. I learn so much from you posts and recipes. Thank you!